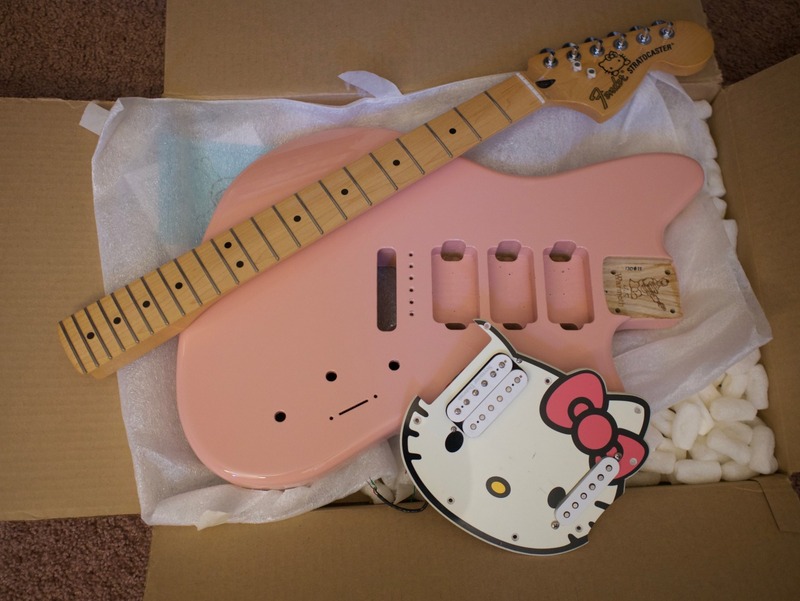 ShortScale :: View topic - I built a Hello Kitty Jazzmaster. I built a Hello Kitty Jazzmaster. Posted: Fri Jul 08, 2016 8:54 pm Post subject: I built a Hello Kitty Jazzmaster. It's a fun guitar and sounds cool, used it in practice doing rhythm for a soul band which allowed to fine tune it further. But for that particular gig, the Mustang sounds so much funkier and looks more the part, too, so I went with a Mustang for the actual show. 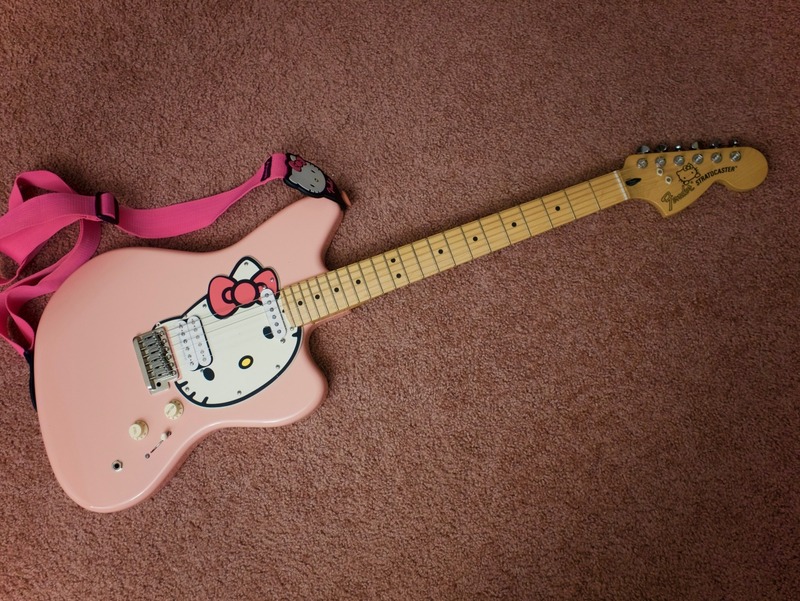 But I'm planning on gigging with my Hello Kitty Jazz in a couple of weeks when I'm playing lead, which is more what this guitar is made for. I'm using DiMarzio Area 58, Seymour Duncan Custom, Gibson 300k pots. 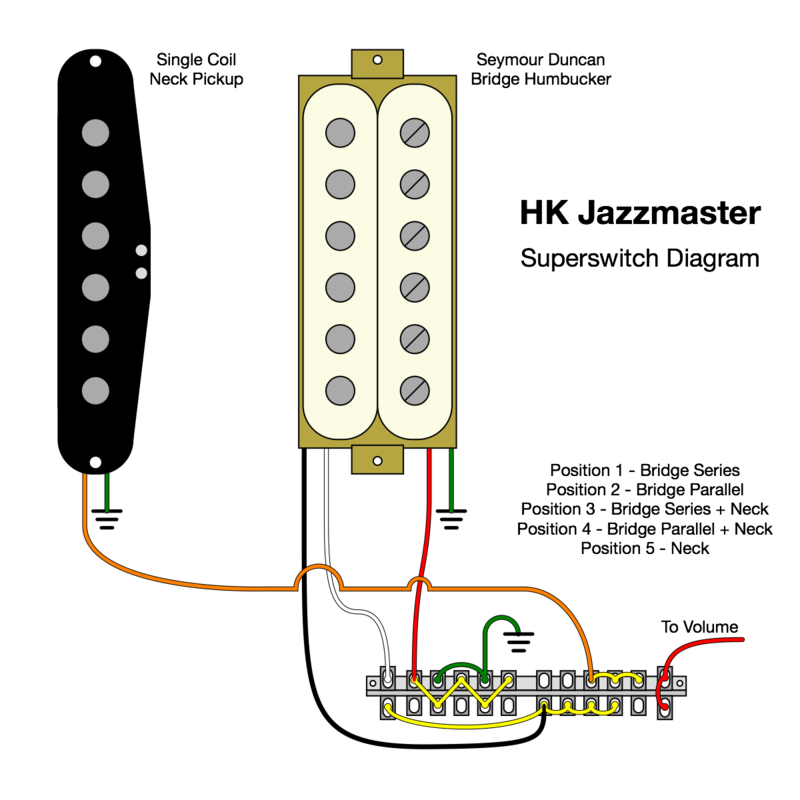 Custom 5-way wiring configuration with a 24-pole switch (neck, neck + bridge parallel, neck + bridge series, bridge parallel, bridge series). After wiring it, I found that the pickups were out of phase (as it often happens when you mix brands) so I flipped the two wires on the neck pickup. I really like the vibrato, it's a Wudtone Holy Grail plate with a Callaham block and GFS block steel saddles. I usually float my fulcrum bridges, but I felt like decking made more sense for this guitar, so it's decked. Finish is Shell Pink from Warmoth. It's super thin like a PRS finish, so thin that I've already chipped it a bit, but that's fine, it'll build character quickly. Price was quite good because Warmoth was having a big sale on in-stock chambered bodies. It's my second time building with Warmoth, and the last time, it was a Mustang body, and I have to say, I like this body a lot better. All the work is top notch. Since it is such a custom build, I had to modify the body a bit, so I went in with a chisel and a Dremel to get the pickup positions just right. Part of me wishes I made it a short scale, but I think I can live with the 25.5" scale on one guitar. 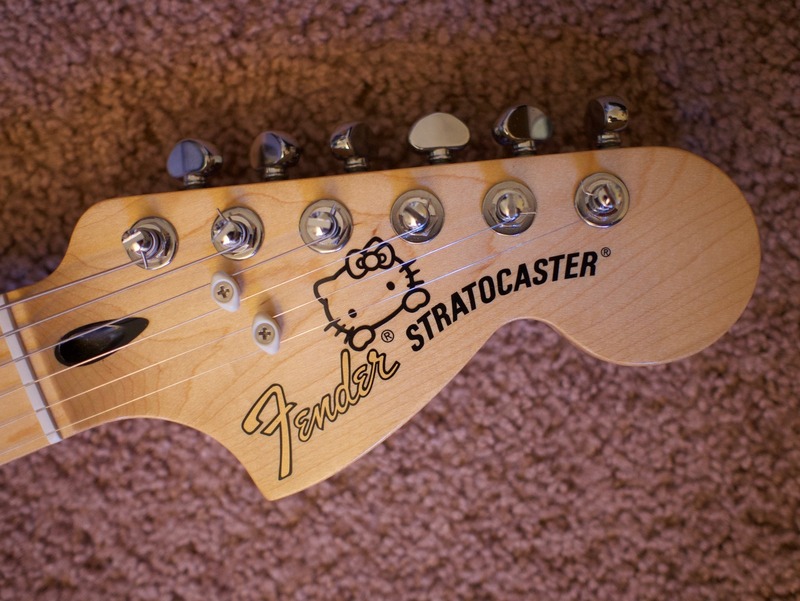 The CBS Strat headstock is the best. My favorite Strat in the world has a maple fretboard with a CBS headstock (Fender Custom Shop Ken Stratocaster), and so did the original Hello Kitty Strat, so I'm glad I found the neck that has the right specs and also the right look for this guitar. Plus, it leaves room for the sticker. That is awesome. I love that. I'd probably love it a bit more with no guard at all. Actually, fuckit, I'm talking balls. That looks great. The offset kitty eyes suits the shape brilliantly. That looks very neat. Pardon my ignorance and laziness, are those the standard string trees for the Lone Star Strat? very cool. love the attention to deal. Obviously this is a special project which is why I stuck a guard on a rear-routed body, which always feels a bit weird, but Warmoth has several options for Jazzmaster styled bodies. My least favorite is actually their regular pickguard, which to me looks wrong since it's just a bit misshapen. But they do a Split Jazzmaster which is simply excellent. Me gusto mucho. Obviously Strat jack is awful, but if you get rid of that, that's a nice look. These are GraphTech White TUSQ XL. The tuners were changed, too. They originally had Fender locking tuners, but I used them for another guitar and then drilled for auto locking Mini Rotomatics on there since those are my favorite tuners ever. 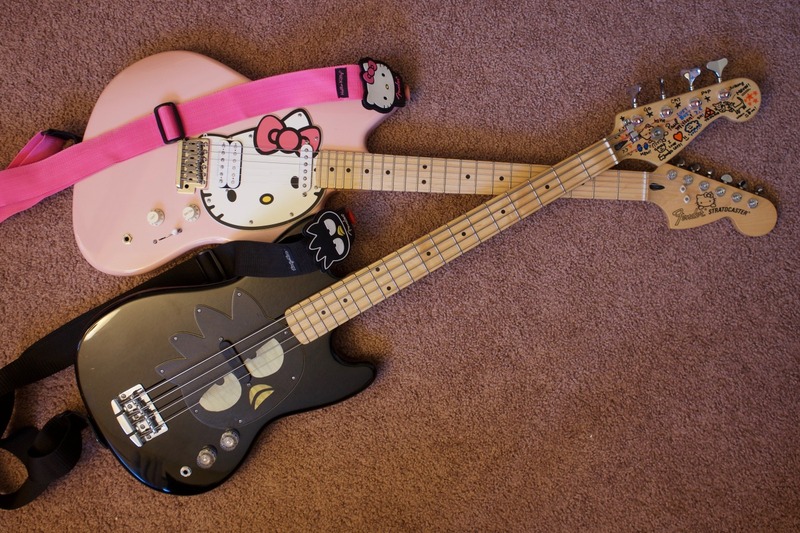 The original Hello Kitty Strat did the same thing. Unfortunately, the rear route is kind of not in the best place, so you can't really add more controls easily. The Warmoth rear routing is gigantic, gives you a lot more room to play. Nice, I like how you added the headstock decal and matching string trees. I love that, it looks ace. The big headstock, maple board, and pink go ace together. I always feel the Jazzy body looks too big without the pickguard going into the top horn and traditional tremolo. But that doesn't detract anything from your project, it's just my general opinion. I don't exactly disagree with that. I do think the Jazzmaster scale is slightly less obviously unbalanced. I really notice it on the Vista Jagmasters, where the bridge is pretty much halfway between the strap pin and the end of the neck. Make me a black one with the Badtz Maru guard! !